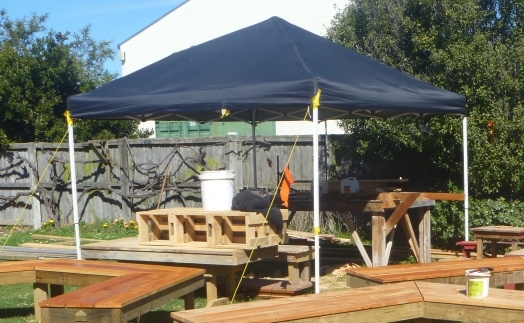 Contact: Shane Hollis, Shed Coordinator, on (03) 981 5594, 022 062 0744 or shane.linwoodresource@accd.org.nz for more details. The Linwood Men’s Shed is up and running at the Linwood Resource Centre, 332 Linwood Ave Christchurch. 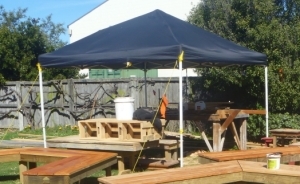 The “Shed” started as a workbench made out of a repurposed concrete shutter, pallets and some fence rail. The Mark II version sees the bench protected from the elements by a concertina marquee, the tarp of which we take down when the really big southerlies are blowing. 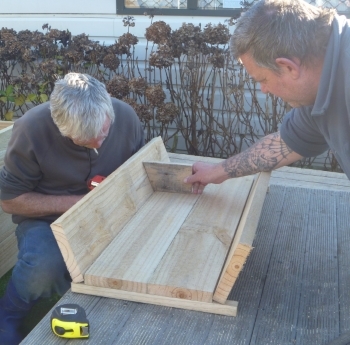 pre-fabricating raised planter beds for Freeville Primary’s contribution to the citywide Avon-Okataro renewal initiative. We are a diverse group of blokes who want to pick up skills, support each other and contribute to our community. Mondays from 11.30ish till 2.30 is our general workshop time with other specific projects happening during the week.